Affectionate and loyal, Otterhounds make wonderful, if a bit boisterous, family pets. They genuinely enjoy human society and are perfect companions for people who live alone. Originally bred to hunt otters, this water-loving hound is large with a thick water-resistant double coat. They have endearingly shaggy faces with bushy eyebrows and deep-set eyes that complement the color of their coats. The Otterhound is one of the oldest of the English breeds and dangerously close to extinction. It is suggested that the breed may have originated in France since it closely resembles the old French Vendien hound. These dogs were trained to track the otters that were exhausting the fish in English streams, and King John kept the first documented packs of these dogs in 1212. This form of hunting reached its peak during the latter half of the 19th century but gradually died out after the Second World War. 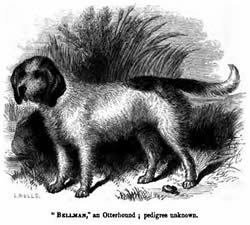 The first dog of this breed was brought to America at the beginning of the 20th century and was recognized by the AKC soon after. This dog breed is boisterous, amiable, easygoing, and affectionate with its family. It can be a good-natured companion for a child. These dogs can be rather messy as well as stubborn, and require a determined master. Living Environment – These dogs enjoy taking part in family activities and need a family that can spend time with a pet. They love to play and swim and a family home with a large- or medium-sized yard is their ideal habitat. Grooming – These dogs require weekly grooming, though the long hair near the mouth needs to be cleaned more frequently. Their thick coats have a tendency to get matted and call for careful combing. Other problem areas include the hairy feet that tend to accumulate dirt and grime. Diet & Exercise – This dog breed needs plenty of daily exercise and, if possible, frequent swimming. Their ideal home is one where there is plenty of space to enjoy activity. They tend to get into exploring an interesting new scent, so care should be taken to keep them on a leash or in well-fenced yards. Health – This is a hardy dog breed, though some strains are susceptible to CHD, CTP, and gastric torsion. It is recommended that you test your pet for hip, elbow, and blood disorders as these are the common problem areas for this breed. These dogs are not the most responsive of breeds and can be stubborn and willful. Dog training for the breed entails plenty of patience, as well as a firm hand. This breed requires the classic “iron fist in a velvet glove” approach.